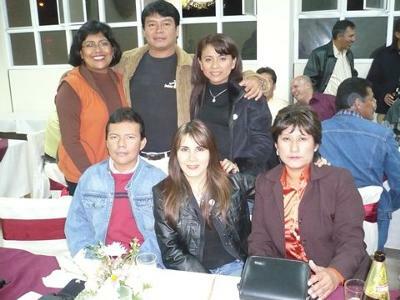 This group of old high school friends met in January of 2008 to celebrate the 40th birthday of one of them, the lady in colors died on May 27th, 2009, just before the 25th reunion of the group on June 20th 2009. 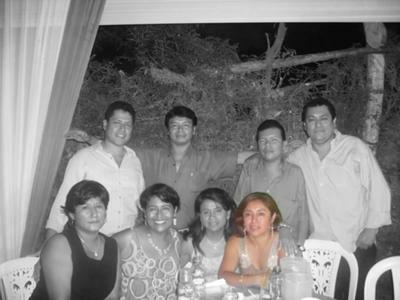 I was looking at both pictures yesterday and noticed that in the reunion picture, the one in colors, most of peoble are the same than on the one from the year before (black and white) but there is an orb on the head of the gentleman in blue that is not participating in the picture. Is it an orb of the girl that died less than a month before of this reunion or just a particle of dust?